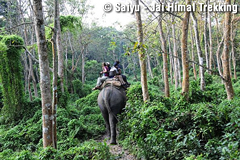 Chitwan National Park is established in 1973 and declared as UNESCO's World Heritage in 1984, became a one of the main Tourist destination in Nepal. Chitwan National park preserve 56 species of Mammal including One Horn Rhino (Indian Rhino), Bengal Tiger, Leopard, Deer, and more than 500 species of Birds, 47 species of Reptiles, 9 species of Amphibian. 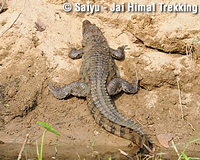 It covers an area of 932 square Kilometers and is located in the subtropical lowlands of south-central Nepal in the Chitwan District. In altitude it ranges from about 100 meters in the river valleys to 815 meters in the Churia Hills. 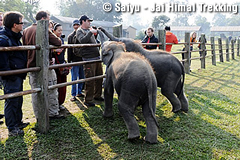 We offer several package for Chitwan, using our Lodge Chitwan adventure Lodge and others. Welcome Drinks, Short briefing about the camp facilities and day and next day schedule of activities ,Lunch ,dinner and Breakfast free flow of tea and coffee. 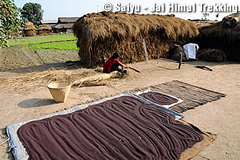 Bird watching , village walk , Elephant ride and culture Program . 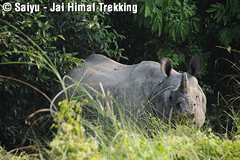 Depending on season and luck, we can see following wild animals: Chitwan National park preserve 56 species of Mammal including One Horn Rhino , Bengal Tiger, Leopard, Deer, wild boar and more than 500 species of Birds, 47 species of Reptiles, 9 species of Amphibian. 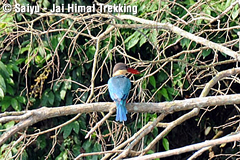 Bird watching , village walk , Elephant ride , elephant breeding center, canoe ride , ox card ride and culture Program. Bird watching , Village walk , Elephant ride , Elephant breeding center , Canoe ride , Ox cart ride , Jungle Drive , Elephant bathing and Culture Program.